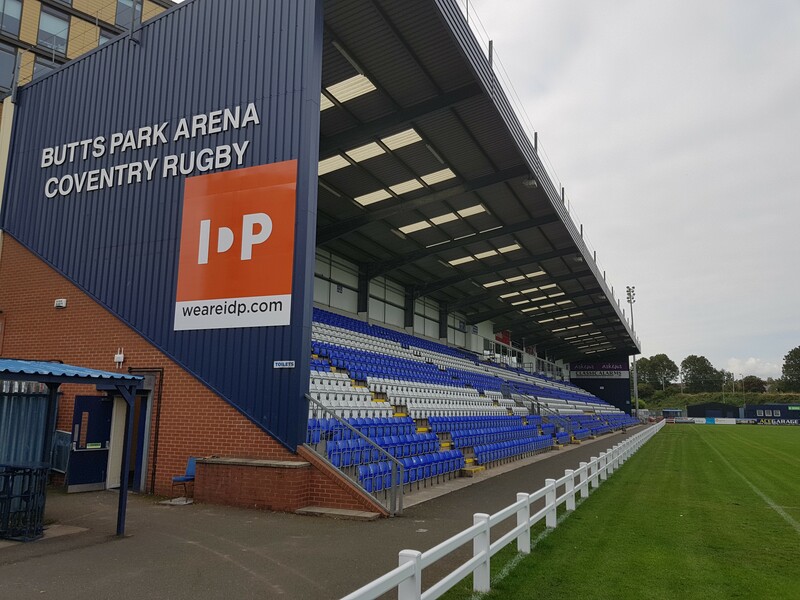 Cov’s fine Butts Park Arena season ended in disappointment as visitors Nottingham claimed a dramatic last-gasp 32-31 round 20 Greene King IPA Championship win. When Gerard Ellis claimed his second try early in the final quarter, the hosts had built a 31-17 lead and with the bonus point already secure seemed set for a comfortable win. But the concession of two quick tries set up a heart-stopping finale which ended with Nottingham fly half Shane O’Leary clinching the points with a final-second drop goal. This meant there was no happy ending for retirement-bound home favourite Sam Tuitupou – who was the sponsors’ man-of-the-match – or the departing Phil Nilsen and Latu Makaafi who all received a huge pre-match ovation. Nottingham were given an early lead by centre Gearoid Lyons who powered over from close range after the visitors took play through multiple phases in the home 22. O’Leary added the conversion and the Green-and-White’s No.10 soon split the uprights for a second time when Cov were penalised on the ground in front of their own posts. But thereafter the home side dominated the remainder of the first half through some excellent high-tempo attacking rugby. David Halaifonua’s kick return took play into the away 22 only for a heavy tackle to fell the supporting Pete White before Jack Ram’s threatening break was ended by the referee’s whistle. However, when Cov did finally get on the board at the start of the second quarter it was through a try of real quality. The move was started by Alex Woolford’s lineout steal, continued by Ram, Ben Nutley and White and finished from close range by Tuitupou. And after Will Maisey tagged on a simple conversion, Cov almost immediately claimed a second converted score when their pack shunted Ellis over following a five-metre attacking lineout. 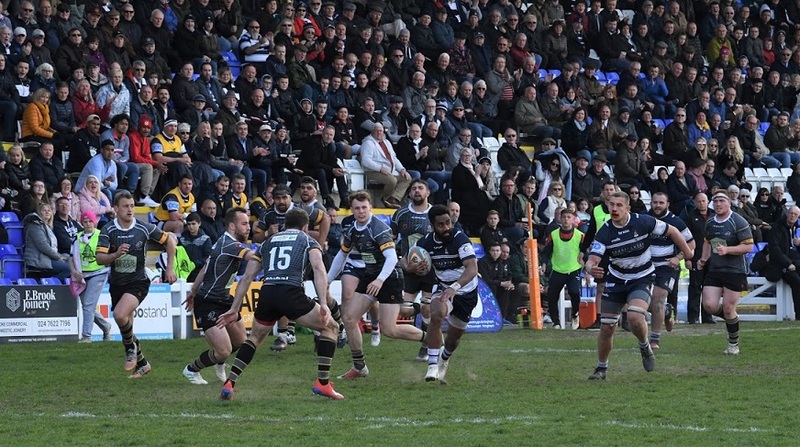 Cov’s No.10 was then narrowly wide from 35 metres after Nottingham failed to release in the tackle, and the hosts also failed to finish off a good chance created by Maisey’s superb dummy. However, the home fly half’s 25-metre penalty – awarded when Nottingham infringed on the ground running out of defence – ensured Coventry took a seven-point advantage into half-time. And after Nottingham failed to convert a scoring opportunity created by Jordan Coghlan and replacement David Williams, the home side stretched their lead through Darren Dawidiuk’s driving lineout score and Maisey’s well-struck conversion. When Cov lost White to the sinbin for a deliberate knock-on the visitors took immediate advantage to shunt lock Shane Buckley over for a try which O’Leary improved. But as the game entered the fourth quarter Cov secured a try bonus point when Ellis capped a fine display with his second try following a series of forward thrusts. Maisey added the conversion, only for the visitors to immediately strike back through full back Sean Scanlon following replacement scrum half Murray McConnell’s sniping break. And Nottingham were back within striking distance with ten minutes remaining when McConnell’s second telling contribution sent Coghlan under the home posts for a try which O’Leary converted. Cov then lost replacement James Gibbons to the sinbin following a skirmish at a scrum, and when Nottingham took play to the other end O’Leary was narrowly wide with a 77th minute penalty attempt. But the visitors continued to pile on the pressure and after James Voss did well to block one drop goal attempt O’Leary made no mistake seconds later with the final kick of the game. Halaifonua; A. Bulumakau (Kessell 55), Stevens, Tuitupou, Trimble; Maisey, White (Knox 60); Ellis (Gibbons 62), Dawidiuk (Tolmie 58), Brighouse (Boulton 48); Russell (Oram 20-30, Voss 48), Woolford; Nutley, Ram, Adams (Oram 62). Scanlon; Spittle, Peters, Lyons (Williams 40), Robinson; O’Leary, Veenendaal (McConnell 61); Sio, Brownlie (Cole 45), Heffernan; Holmes (Cox 61), Buckley; Coghlan, Owen (Jones 17), Poullet (Cecil 52). Posted in Match Reports, News and tagged greene king ipa championship, Nottingham Rugby. Copyright © Coventry Rugby 2019 / Powered by Sort-IT.Biz Ltd.